I had an old version of ML on a card (~July 2015) and didn't use it. Was in the middle of a video and the camera crashed with Error 70. I removed the battery/card, reinserted both and it came back on. However it is an off-brand battery so I assumed it was that. However since then, I have had multiple Error 70 and Error 80 errors with a genuine battery too. I removed ML via formatting the card in-camera (Ticking the remove ML option) to make sure it wasn't that, and also factory reset the Camera. My camera froze again with no error, so I took out/removed battery and card, then put them back in. I then switched it back on, and it came up with a firmware upgrade error screen that had a orange background. I was confused as I'd removed ML. I then turned it back on again, and it will not switch on with Multiple Batteries or Cards or Lenses. Workaround: place a recent build on the card and make it bootable. Fix: either run a Canon firmware update, or ask @nikfreak to call this for you (any of those two should do the trick). Sorry, what is the procedure for doing that? Clicked that link but it doesn't mean much for me, sorry. 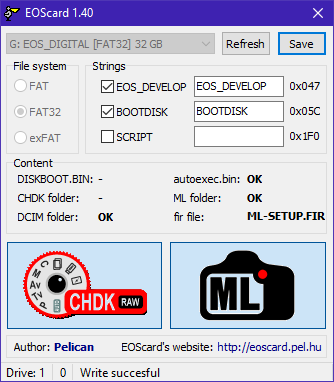 I went through the process of making a card bootable with the latest build of ML for the 70D (using EOScard). However I have a feeling I am running Firmware 1.1.1 so it may not work anyway? I can't find a version of ML for that specifically. Anyhow, it will not boot, no light flashing or movement whatsoever. I also have tried to use the EOS Assist software to update the Canon Firmware from my PC but that does not work either as the Camera does not show as connected. It shows no life whatsoever. I have tried an empty card that I formatted with another Canon camera to make sure, and 0 results there either. Using a fully charged genuine canon battery with no lens attached. I can basically presume that it is bricked? The "firmware upgrade error screen that had a orange background" appeared only once? If this screen appeared after formatting your card and removing ML, I'd expect it to appear every time you take the battery out and put it back, if you start without card, or with a non-bootable card. Once you place a bootable card with autoexec.bin on it, the camera would load that one instead of showing the error screen. Some older installers had this bug. Are you able to run the portable display test? That should work regardless of the firmware version you might be using, and the same (bootable) card should work on all ML-enabled cameras. Note that, before each startup attempt (or after each failed startup attempt), you should remove the battery and put it back (because the power switch is only a soft button). Also, if you left the camera in a "locked" state for a long time (e.g. after starting from a bootable card without autoexec.bin), you should charge the battery. The "firmware upgrade error screen that had a orange background" appeared only once? Yes. I was using a card that had had ML on it, but I had removed it. Prior to that I had the Error 70/80 problems. I'd expect it to appear every time you take the battery out and put it back, if you start without card, or with a non-bootable card. I have grabbed the autoexec.bin, should I put that on a bootable ML sd, replacing the original autoexec.bin? Quick Update: Put ML for 70D and that autoexec on an SD, made it bootable (http://i.imgur.com/t0lrPB3.png) and tried again. No result, LCD, light flash or anything. Battery is fully charged. Also, I just remembered- prior to the Error 70/80 I would have the UI freeze- the touch screen would just stop responding etc. When I turned it back on after removing the battery is when I got the error codes. Is it possible to be a hardware problem? Edit: found a boot flag configuration that would not load the main firmware and won't display anything on screen either (menu flag set to 0). I can't imagine how it could reach this state though. Also found a way to boot IMGTEST.BIN, which does not require the card to be bootable, but it's not interesting for this case (as it first displays the firmware update error, and only then it boots from this file). I'd like to try a more unusual route: the bootloader messages can be seen on the serial port (which was found on PowerShot - see CHDK and nada-labs, EOS M3 which is also a PowerShot, but to my knowledge, nobody attempted to find one on EOS firmware). If we manage to find that port, we should be able to recover from it (if it's what I think). Unfortunately, at this stage I can't imagine a software-only solution for troubleshooting it. BTW, @nikfreak: any progress with your JTAG experiments? I really appreciate your efforts Sir. Why is the Camera expecting to boot ML when I had formatted the card in-camera (Selecting to remove ML)? The boot flag on the camera is still active (formatting the card only removes the boot flag from the card). Looks like the serial pins might be in the battery slot. Time to sell for parts then. could be ideal for tinkering.